St. Mary, Star of the Sea has a long history as a Faith Community in Oceanside. Here’s the “back-story”. The Franciscan Friars established San Luis Rey de Francia as the 18th mission in the chain of California Missions in 1798. They dedicated their mission church building in 1815 and flourished with a mostly Native American population (renamed the San Luiseños). In 1833, the Decree of Secularization was issued by Mexican Governor Jose Echeandia and the mission remained in the hands of the government until President Lincoln returned the chain of missions to the Catholic Church in 1865. In 1893, a serious rebuilding effort was begun on the deteriorated old mission. Oceanside had already established itself as a new community in what is now North San Diego County and was incorporated in 1888. The 1890 U.S. Federal Census lists Oceanside’s population at 1,273. In those early days, a priest passing along the coast would stop over in Oceanside long enough to hold Sunday services. On such occasions, Mass would be said in a private home or even at times in the ruined old mission church at San Luis Rey. Around 1890, Fr. Robert J. Byrne arrived in Oceanside hoping to regain his health here. On April 5, 1893 (Easter Sunday), the first Mass was celebrated on a downtown site. (It is the first documented evidence of St. Mary’s Faith Community.) Fr. Byrne worked with the local Catholics to have a small chapel built on the corner of Ditmar and Third Street (now Pier View Way), on land which he donated. After much prayer and effort, the chapel, a 20x30 small wooden building, was completed in 1896 and dedicated to the Blessed Virgin Mary that same year. Fr. Byrne eventually regained his health and left Oceanside. Mexican Franciscan Fathers at Mission San Luis Rey then took over the spiritual care of the faith community. Early church records were kept at the Mission and, over the years, many of those records were either lost or destroyed. According to available Mission San Luis Rey records, there were seventy-three local families in our congregation in 1917; ranches at Santa Margarita and Las Flores added another five families and forty-six workers. Although the congregation was small, improvements were made to the chapel from time to time. In 1915 it was wallpapered, painted, and the windows repaired. In 1920, a bell tower was added. The solemn blessing and raising of the new bell was on April 4, 1920 (Easter Sunday) and “was attended by a goodly concourse of people”. Jerome O’Neill of Santa Margarita Ranch was granted the privilege of being the first layman to ring the bell. The bell was cast in 1919 in St. Louis, Missouri and is still in our current bell tower. The construction of the new church was led by Fr. Luke Powelson; it was opened for divine services on April 10, 1927 (Palm Sunday) and was dedicated on October 22, 1927 by the Most Rev. John J. Cantwell, Bishop of Los Angeles/San Diego. From 1913 to 1937, the priests at Mission San Luis Rey administered to the faithful in Oceanside. In 1936, The Diocese of San Diego was formed from the former Los Angeles/San Diego Diocese and Bishop Charles Francis Buddy of St. Joseph, Missouri, was installed as the first Bishop of San Diego. On August 1, 1937, FATHER NORMAN C. RALEY, became the first priest of the newly formed Diocese of San Diego to become a resident pastor here. Over the years, many parishioners have taken a personal interest in enhancing the beauty of our church. The “Madonna Mosaic”, which is installed just above our church’s front doors was created and donated by Mrs. Bella Beauregard in the early 1960s. Mrs. Beauregard used 22,617 pieces of tile imported from Norway, Denmark and Italy to create the finished mosaic. For about ten years, the original church, affectionately called the Capillita, and the new church occupied the property together. The Chapel was then moved to its present location at 1510 Lemon Street. The salvation and relocation of the chapel was made possible through the donation of the land by Mrs. Mary Carter and Jose Quiroz. In 1949, a rectory was built on the site of the original chapel to provide quarters for the resident clergy. In the very early 1950’s, under the direction of MSGR. THOMAS LEHANE, a parish school was built eight blocks south of the church on the corner of Ditmar Street and Wisconsin Avenue. This 5-acre location was chosen because there was no room to build in the downtown area. The property located from 601-607 Third Street (now Pier View Way), was originally home to four separate businesses and the Parish Center was a Kaiser-Willys car dealership. If you grew up in post-War Oceanside, you will most likely remember the previous look of downtown Oceanside. Due to the vision of MSGR. WILLIAM CLAVIN (Pastor 1964-1983), these buildings and land were purchased from Ray Burgess in 1975 and have been used for parish purposes ever since. Father John moved our parish offices from the rectory building to the Ministry Building (with the glass doors). We operated out of that building until 2002. Father Lucev was transferred to St. Kieran’s in El Cajon in 1989. It wasn’t until the 1980’s that downtown redevelopment really took hold. The current Civic Center was dedicated in December 1988 and our neighborhood started to look and feel very different. In the mid-1980s, the sanctuary furniture was custom-made by a local craftsman for St. Mary’s and donated by Jens and Agnes Matthiesen. These items include the altar of sacrifice, the ambo, the celebrant’s chair, and the former baptismal font. (The current marble baptismal font was donated by Gilbert Nares during our 75-year Renovation in 2002.) The stained glass windows in the doors between the vestibule and the nave of the church were handcrafted and donated by Jens Matthiesen. Many special pieces of furniture in the church were handcrafted by Robert Trost. FATHER JIM McGRAY (Pastor 1989-1991) was with us for two short years while on a sabbatical from the University of San Diego. During that time, he had the vision (and saw it to fruition) to remodel our vacant convent into a Preschool. The Preschool is still thriving today, thanks to the dedication of Debbie Shapiro who served as the Director from 1991-2017. Also during his brief time here, he consulted with the Arts & History Departments of USD regarding the historical significance of our church. The most significant aspect of the renovation was the removal of all the wood paneling from the walls in the nave (under the stained glass windows) and behind all three altars. FATHER STEVE McCALL, now serving the faith community of St. Mary Magdalene in San Diego served our parish from 1991-1996. We were the first parish in which Fr. Steve served as a Pastor. Our parish thrived under his spiritual guidance. In 1993, St. Mary, Star of the Sea parishioners celebrated 100 years as a Faith Community with a grand celebration. FATHER JOHN DOLAN (now Auxiliary Bishop of San Diego) came to St. Mary, Star of the Sea in 1996, also as a first-time Pastor and was with us until 2001. Fr. John saw an opportunity to expand our real estate holdings when the former Security Pacific Bank was available for sale. It was built in 1963 on the southwest corner of Pier View Way and Freeman Street as the Security First National Bank (replacing an earlier bank that was built in 1946). The present structure was designed by Deems Martin Architects of San Diego, recognized for their various and notable commercial buildings in San Diego. St. Mary’s purchased the building and property in 1997 from E.J. Terry and a remodel quickly followed. With the purchase, our level of activity was able to increase as groups and ministries had a new place to meet. FATHER PATRICK MULCAHY (Pastor 2001-2005) brought with him his famous “black bag”. Father Pat captivated the parishioners with a story and a prop from his bag. He would follow up with a very meaningful homily that fed our souls. Fr. Pat was known for his humor and his kind heart. While he was here, he ran a “75-Year Renewal” campaign. During this time, the floors were sanded and restained, the pews were refurbished, and every wall was painted. Scaffolding was installed, and 75 years of dust was vacuumed off the rafters. They were then expertly restained and restored to their original beauty. Father Pat is currently the Pastor at St. Joseph’s Cathedral in downtown San Diego. FATHER MICHAEL DIAZ (Pastor 2005-2017) came to St. Mary’s upon retirement from the Navy’s Chaplain Corps. Father Mike served our parish with a big heart. With his encouragement, our English-speaking and Spanish-speaking communities thrived and came together as never before. For two years, we had a “Mass at the Beach” in the Junior Seau Memorial Amphitheatre. It was a beautiful multi-cultural community event. We also started our annual Thanksgiving Dinner which is a cooperative effort of all our groups and ministries. On Pentecost Sunday 2013, our parish was introduced to Stewardship as a Way of Life. Barbie Matthiesen was the Stewardship Director for the first four years, followed by Debbie Shapiro. St. Mary’s began to focus more on hospitality, using our God-given gifts to give back, and growing as a faith community. Father Mike retired in 2017. Our current Pastor, FATHER GERARDO FERNANDEZ, came to St. Mary’s in 2017. He has been making strides to return our church to the basics. Father G has launched a campaign to restore our church to its historic beauty by its 100th birthday in 2027. Located on the east side of the church facing Ditmar Street is our Memorial Wall. The Wall was built and dedicated in 1997. Since that time, many parishioners have had plaques placed on the Wall engraved with the names of friends and family. Mass is offered each month for the people whose names are enscribed on the Wall and for those who love them. You may contact the Parish Office to obtain information about purchasing a plaque. In front of the Memorial Wall is a statue of Mary, Star of the Sea which was dedicated in May 2009 by the family of Don Hoyt in his loving memory. 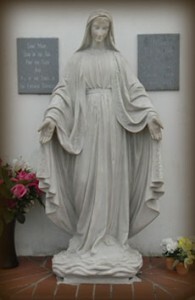 The statue of the Madonna of the Streets, which was donated by Mr & Mrs Harry Cottam when the wall was constructed in 1997, succumbed to the elements in early 2009. We give thanks to God for the abundant blessings He has poured out on our Community; For the Pastors who have shepherded us throughout the years, whose names are known to God, who have supported this Community with their prayers, their time, their financial support, and with their love. "Behold, how good and how pleasant [it is] for brethren to dwell together in unity!" Our parish has undergone some significant changes recently. We have begun to renovate our 85 year old church and its surrounding buildings that we use for fellowship and ministry. We have also begun a personal renewal, most significantly a journey toward better understanding of our fellow parishioners and a quest for unity. I believe that God is smiling on the faithful of St. Mary, Star of the sea as we move forward in our unified efforts.